Can an authentic artistic project become an actual bar? There have been plenty of temporary installations and pop-up bars in recent art history, but a fully functional bar, open to the public and perfectly contextualized in the neighborhood is a rare artistic challenge. 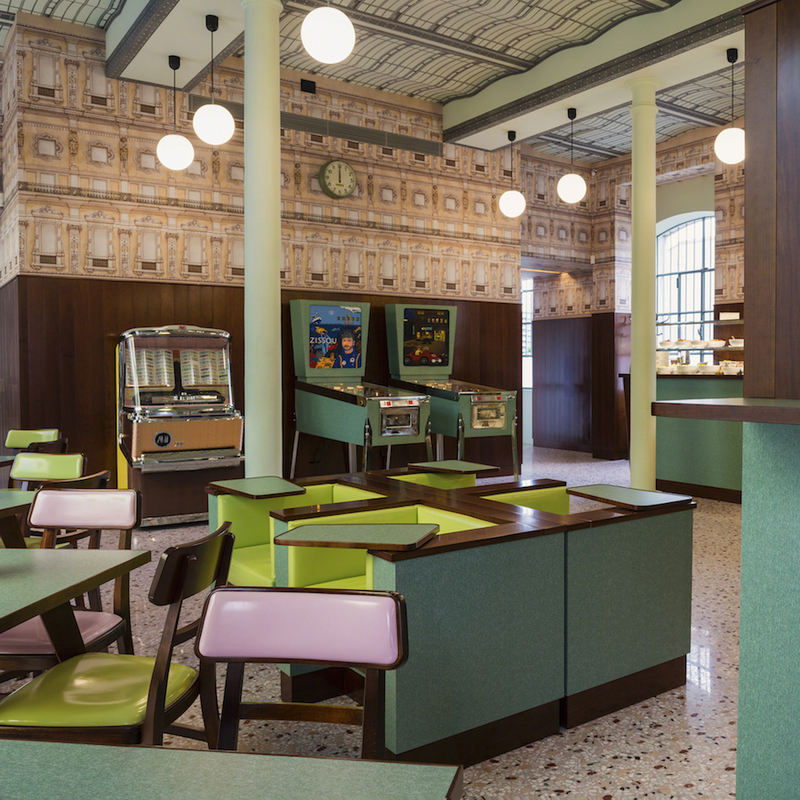 Judging from the success of Bar Luce, Fondazione Prada has risen to the challenge and the answer is definitely yes. 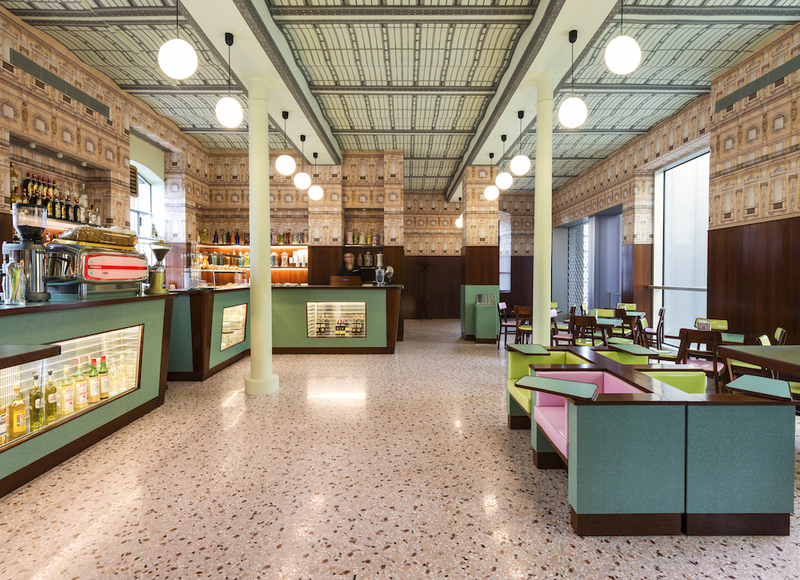 Part of the new astonishing Milanese headquarter of Fondazione Prada, the bar has been conceived by film auteur Wes Anderson and—despite its distance from the city center—has rapidly become a hotspot for the lovers of food, art, design and fashion. Bar Luce can be accessed both from the street and the Foundation. In both cases, the game of contrasts is the key to a surprising experience. The neighborhood is a former industrial area, slowly being gentrified but still very authentic, while the main architecture (a clever union of old and new in a masterpiece of cement, metal and glass by Rem Koolhaas) couldn’t be more distant in terms of overall experience. The actual inspiration for Bar Luce is a traditional Italian bar—an institution that has almost disappeared in real life but easy to visit in old Neorealist films from the Golden Age of Italian Cinema in the 1950’s and 1960’s. 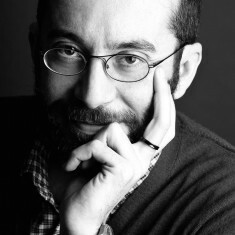 Anderson’s surreal and delicate touch is immediately recognizable in the atmosphere of the venue, a result of a unique mix of pastel colors and dark tones, contemporary and vintage materials, mysterious wallpapers, a retro pinball machine and one jukebox. The main materials are formica, veneered wood, marble, stained glass. 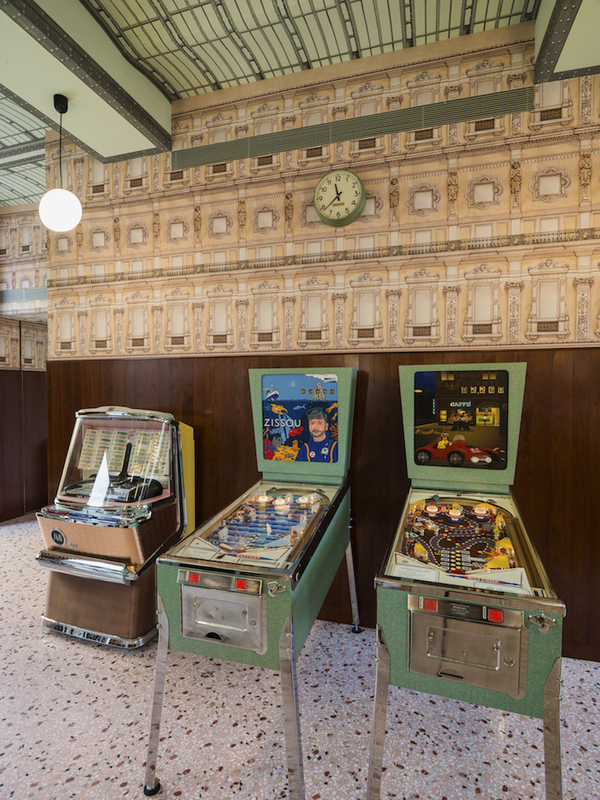 The walls are covered with wainscoting and made-to-measure wallpapers reproducing images of Galleria Vittorio Emanuele II, a Milanese institution and one of the world’s oldest shopping arcades, with a kaleidoscopic effect of repetition. The walls and iconic glass roof of the historic arcade are thus evoked and made hyperbolic, not simply represented, with a true artistic approach. This is how Anderson has been able to make the Bar part of the art experience of the Fondazione Prada, while at the same time showing something deeply rooted in the city. The seating at Bar Luce is also worth mentioning. There are outside tables (facing the golden tower of the Fondazione), classic round tables, as well as cozy padded seats where you can sit and enjoy your food thanks to a small formica tray. The latter are for sure the most requested, both by adults and children. A kitschy effect is avoided thanks to this wise mixture of nods to the past and contemporary elements such as USB sockets for charging electronic gadgets. In addition, some details such as the arched ceiling of the former industrial site have been preserved. A rare feeling of poetry is the overall mood of Bar Luce, underlined by the old-fashioned manners of the waiters. A rare feeling of poetry is the overall mood of Bar Luce, underlined by the old-fashioned manners of the waiters. 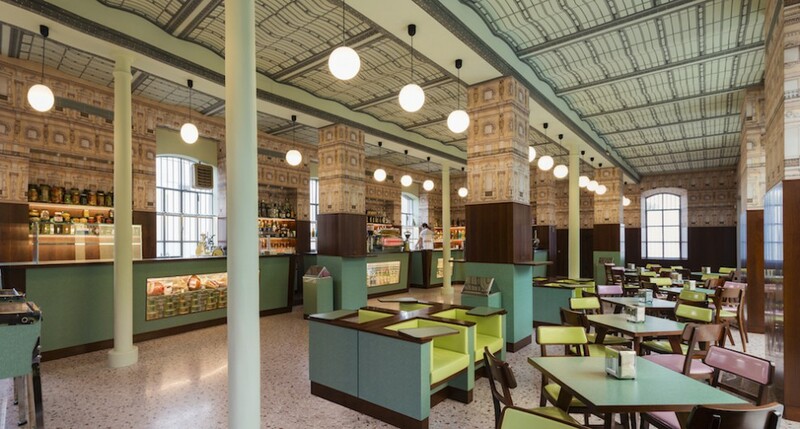 At Bar Luce you can enjoy traditional aperitifs and spirits, tasty sandwiches, a wide range of colorful cakes and pastries from the historic Pasticceria Marchesi, not to mention a selection of real Italian fast food—cheese and salami—for a quick lunch.